The deadline for bids to build Duluth’s aerial transfer bridge came and went with no other submissions, but a contract with Modern Structural Steel (MSS) wasn’t signed until July 20. Not that that had slowed work. During the entire time the contract was under negotiation, bridge architect C. A. P. Turner worked with MSS to refine the bridge plans. Matters arose over the type and horsepower of the electric motors, load specifications, wind pressure, a housing for the roller-bearing trucks, even the number of rivets used per foot. It wasn’t always the smoothest of processes, as Turner tenaciously fought to hold MSS to his ideas. The letter indicates that Patton had initiated some design changes contrary to what he and Turner (and MSS) had previously agreed on, suggesting that the sway system Turner had specified wasn’t sufficiently strong and needed bolstering. But Patton and his assistants had misread the specifications upon which they based their calculations, and Turner was angry about the time and expense needed to create “an exact diagram that good-naturedly explained [Patton’s] erroneous method” when, with a little courtesy on Patton’s part, the whole matter could have been explained in fifteen minutes. Turner then pointed out that while Patton’s salary was guaranteed by his position with the city, Turner himself was “forced to accomplish results in securing his bread and butter.” Patton should be more considerate of his time, Turner implied, because Turner had to actually work to earn his money. After receiving Patton’s conciliatory reply, Turner told the City Engineer that he was “glad to see you recognize that our interests should be identical” and then praised Patton’s “good judgment” in abandoning his own proposed changes and staying with Turner’s plan. But once he took these small jabs, Turner turned his full focus once again to the bridge. Meanwhile, MSS worked without a contract, urging approval of the tower plans by March 11 so the company could immediately start building them. W. H. Hoyt, an engineer with the Duluth, Missabe and Northern Railway (DM&N), inspected and approved the steel for the towers and, later, the roller bearings. He expressed concern over the housing for the roller bearings, seeing no protection from “blocking up with sand in the summer and snow and ice in the winter.” These “roller nests” and the bearings they held were the key to the bridge’s smooth operation, and time would prove that protecting them from the elements wouldn’t be their only problem. On July 20, officials from the city and MSS finally signed a contract. Two days later the first carload of steel arrived at the piers. The testing laboratories had found the metal work excellent, with all parts “fitting perfectly, without reaming or drifting.” On August 1, workers had the leg of one of the towers in position. By October work was well underway, and other than a reminder from the head of the Corps of Engineers to be more careful to protect the government’s piers—on October 10 builders had accidentally broken off a lamp post on the North Pier—it was progressing smoothly. In mid November both towers stood in place, but workers had to wait for the shipping season to end before putting up the “false” wooden supports needed to bolster the towers as the truss was built piece-by-piece to connect them. 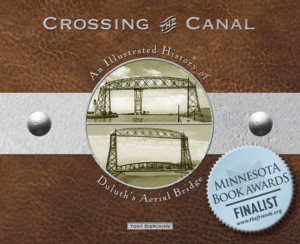 MSS had, according to McGilvray’s annual report, worked with the engineer’s office “with the utmost courtesy, and has promptly attended to everything pertaining to the safety of the public.” McGilvray even expected the company to turn the bridge over to Duluth before April 1, 1905.